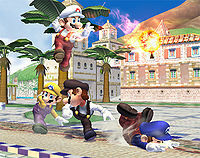 The Mario on the far right can be seen Prat Falling. Tripping (転倒, Falling Down; officially called prat falling and referred to in game files as slipping) is a gameplay mechanic introduced in Super Smash Bros. Brawl in which a fighter trips, falls over, and sits in a prone state with a confused expression. Certain attacks can cause opponents to trip, and some items (including Poké Ball Pokémon and Assist Trophies) will cause tripping without directly attacking at all. Most attacks have a chance to trip provided the knockback dealt does not lift the target off the ground, while a few attacks are guaranteed to trip opponents. In Brawl only, when the control stick is tapped so that the character performs a dash, there exists a 1% chance that the character will trip. In addition, if the character attempts to perform a turnaround during their run, there is a 1.25% chance that they will trip. Brawl keeps track of the total number of Prat Falls each character or name has experienced in Group Brawls. Kirby in his tripped position after stepping on a Banana Peel. The sound effect for tripping changes depending on whether the character tripping is from a "cartoony" or "realistic" series. In general, characters from more serious or "realistic" franchises make a light, quick whooshing sound, followed by an unimpressive falling-down noise, while more cartoonish characters make a swabbing noise, like a sliding mop, before landing with a distinctive timpani noise. This sound effect is significantly louder in SSB4 than in Brawl. When sitting down, a character has the same options as when lying down; however, a tripped character is more vulnerable. Unlike prone or supine fighters, sitting fighters can be grabbed; attacks from a sitting position are weaker than from a lying down position, usually dealing 5% as opposed to 6%, lacking transcendent priority, and possessing only 8 intangible frames (getup attacks are usually intangible until the attack's hitboxes end); and rolls and stand-ups are generally subpar to their lying down counterparts, possessing fewer invincibility frames while still retaining their long animations. Dash-dancing is based on the intial dash animation, so tripping can occur during dash-dancing. In Brawl, whenever the control stick is smashed left or right to input a dash or running-turnaround, there is a 1% / 1.25% chance for the player to trip, respectively. Note that by doing a side-smash or side-special input, they will usually start with some dash frames, so these can also have a 1% chance to trip. Terrain with a lack of traction, such as ice, increases the chance of tripping by 2.5x. Any attack with more than 55 units of knockback, and an angle that doesn't lift the foe off the ground has a low chance of tripping them. This rate is 13.5% in Brawl, and in version 1.1.4 of SSB4 it was changed to 7%. In addition, some attacks have an additional trip chance. For example, a move with an additional trip chance of 40% has a combined trip chance of 53.5% (Brawl, old SSB4) or 47% (current SSB4). Even with less than 55 units of knockback, moves with a bonus trip chance always add the base trip chance. Tingle from the Assist Trophy can summon a banana peel effect, causing constant tripping to all opponents until he leaves the screen. Luigi's Negative Zone can cause incessant tripping. Certain hazards such as the wall on Port Town Aero Dive can cause tripping. Most attacks can only make an opponent trip if the target is not already sitting down and the attack knockback does not knock the target into the air. However, some have the slip effect and will therefore result in a trip regardless of these circumstances; these are represented in this list with "Always". *Copy abilities not mentioned are the same as their originals. As in Brawl, attacks can only trip if they do not knock the target into the air, so most attacks with trip chances will never trip or will only trip at low percents. Some attacks have the slip effect and cause soft trips that immobilize for around 30 frames, while attacks with trip chances cause hard trips that immobilize for around 40 frames. Attacks with slip are noted here with Always. * The unused fourth variation of this move has a trip chance of 40% instead. ** As this causes the stun effect, it can only cause tripping if the target cannot be stunned. Brawl's addition of random tripping was highly controversial. Though sometimes a mere annoyance in a brawl, random tripping has the potential to significantly impact matches. Since tripping leaves the player in a significant state of vulnerability while moving them a small distance forward, it is a common occurrence for players to unintentionally trip into an otherwise avoidable attack; the effects of this can range from minor damage to a premature KO. Tripping also leaves a player in a vulnerable position, akin to a tech-chase situation. Upon tripping, a player has three main getup options; rolling, standing up, or using a getup attack, and this means that an opponent can more successfully predict the action of the tripped player, often using this to land an easy combo or KO. On the other hand, in rare cases random tripping can also make it slightly more difficult to read an opponent; a fighter may read an opponent's action and input a punish, but instead, the opponent trips, keeping them out of the reach of the attack. The randomness of Brawl's tripping mechanic was generally negatively received, viewed as counterproductive to the idea of a skill-based match with a minimum of disruptive, chance-based elements. Furthermore, unlike some other heavily chance-based elements such as stage selection or item availability, random tripping cannot be turned off in Brawl. Owing to its negative reception, gameplay mods generally remove random tripping from gameplay. While random tripping is considered a detriment to tournament play, forced tripping by certain moves is generally better-received, since, unlike random tripping, its deliberate use can be planned for and planned against. 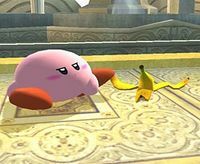 As such, forced tripping is an integral part of some characters' metagames, such as in the case of Diddy Kong and his banana peels. Despite random tripping being removed in Smash 4, forced tripping is still important in some characters' metagames, such as Diddy Kong again. Super Smash Bros. Melee features a bonus called "Pratfaller". It has no relation to Brawl's and SSB4's tripping, and is instead awarded to players who always fall face-up after tumbling. Tripping was first discovered during the Brawl demo at E for All. It was not recognized as random at the time, and some players tried to learn how to trigger it at will for use as a technique. For a time, it was known as Ink Dropping, as noted in Gimpyfish's famous SmashBoards thread. While characters from the Kirby and Kid Icarus universes generally use the "cartoonish" tripping sound, Meta Knight and Palutena use the "realistic" sound, even though they have similar aesthetics to the other characters in their respective series; this is presumably due to their being more "serious" and adultlike in terms of personality, although other such characters as Mewtwo or Rosalina do not follow this rule. Similarly, Toon Link is the only The Legend of Zelda character to make the "cartoony" noise, but this is justified because of his being based on the cartoonish Wind Waker aesthetics rather than the more realistic Twilight Princess ones used by the other characters. Additionally, Mii Brawlers use the "cartoon" tripping sound effect, while Mii Gunners and Mii Swordfighters use the "realistic" noise. This page was last edited on December 23, 2018, at 16:32.